Located in the picturesque region of Tuscany, Florence is an art-lovers' dream come true. You can find jewels of medieval and Renaissance Italy â€“ from Michelangelo and Leonardo to Donatello and Botticelli. See the grandeur of the Renaissance basilicas, Gothic Duomo and the Romanesque Baptistery. Right across the station, you will find the Basilica of Santa Maria Novella. Today Florence is a blend of timeless beauty and haute couture. The entire city center is listed in the World Heritage Sites by UNESCO. Florence continues to remain a center for specialized institutions for culture and art. While in Florence, do not leave without walking under the portico of the Mercato Nuovo and rub the nose of the famous porcellino â€“ it is supposed to bring you good luck! With Florence as a base, you can explore the rest of Tuscany, be it Pisa, Siena or the Chianti countryside. There are flights to Florence Vespucci Airport regularly. If you are flying a low-cost airline, you are likely to arrive in Pisa's Galileo airport. Take the airport shuttle service to Florence; you should take about 70 minutes. You can take the motorway connecting Florence to Siena. This can take you along the picturesque resorts of Pisa, Lucca, Prato and Montecatini along the Tyrrhenian Sea. You can pick up fine fashion from luxury boutiques as also artistic pieces from antique stores. Visit the Mercato Delle Pulci or the Flea market on Piazza dei Ciompi for unique bric-a-brac, old books and artifacts. The San Lorenzo market is open on weekdays for clothing, leather and souvenirs. Here you can find an excellent food market too. Savor wines from the Chianti region along with Florentine cuisine â€“ ribollita soup, Florentine steak, crespelle alla fiorentina. If you happen to be in Florence on Easter, you can catch the 'Scoppio del Carro' or Explosion of the Cart. Christmas is particularly magnificent with decorations and lights. A special procession of the Magi is taken out on Epifany. Galleria degli Uffizi: This is probably one of the finest collections of Renaissance art, with nearly 1500 works lined out in chronological order. Built in the shape of a horseshoe, from Piazza della Signoria to the Arno River, this building was originally constructed to house administrative offices. A few rooms were earmarked for showcasing the collections of the Medici. Do not miss the Vasari Corridor linking the Uffizi with the Pitti Palace. This length of corridor with circular windows houses self-portraits of many painters. Ponte Vecchio: This stone bridge across the narrowest points on the Arno suffered considerable damage during WWII. 2 medieval towers survived Nazi onslaught. The Duomo: Also called the Florence Cathedral or Church of Santa Maria del Fiore, this huge Gothic structure with its characteristic dome stands tall over Florence city. 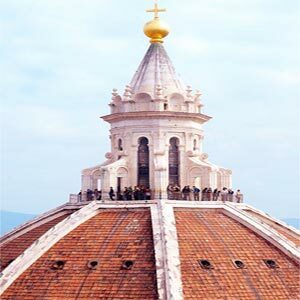 Brunelleschi's magnificient cupola is awe inspiring. The faÃ§ade is made with pink, white and green marble. Hailed as the fourth largest cathedral, The Duomo has Spartan interiors bearing some masterpieces. Others were moved to the Museo dell'Opera del Duomo next door. Climb up the Cathedral dome to appreciate the geometric marble pavings. Santa Croce is the place where some of the prominent persons of Florence are buried; Michelangelo, Rossini, Machiavelli and Galileo. You can find a memorial to Dante. The Church of Santa Croce is rich in marble faÃ§ade and artistic wealth. You can find beautiful frescoes by Giotto and relief work by Donatello. Basilica di San Lorenzo: This oldest church of Florence dates back to 1420. Do not let the simple rough-cut stone faÃ§ade misguide you. The interiors are rich with classical Corinthian columns of grey stone that are accentuated with the well-lit natural lighting. The St. Trinity Church or Church of Santa Trinita is an ancient medieval building; built partly in Romanesque style and later in Gothic style. The interiors are home to rich artwork in the chapels. The Davanzati Chapel houses the beautiful Crowned Virgin by Bicci di Lorenzo. The Spini Chapel is home to the Holy Bishop by Alessio Baldovinetti. You can also find a wooden statue of Magdalene by Desiderio da Settignano. Other notable buildings are Palazzo Vecchio, Loggia della Signoria and Neptune's fountain. Visit the Accademia Gallery to catch a glimpse of Michelangelo's David. Other notable museums include the Bargello Museum and Opificio delle Pietre Dure . Beautiful libraries such as Biblioteca Laurenziana and Biblioteca Nazionale are worth a visit.